History has proven to be a great teacher for the human race, we have seen that our ancestors were extremely intelligent, with amazing knowledge on subjects such as astronomy, geometry, mathematics and other important sciences but they were amazing artists as well. From the construction of the great Pyramids of Giza to paintings in the Renaissance Era and further on, incredible stories have been told that have been difficult to explain. In this article we focus on some of the most interesting paintings of that period in History as we look at “The Baptism of Christ” by Aert De Gelder, “The Madonna with Saint Giovannino“, “The Annunciation” and other very interesting pieces of art that tell incredible stories. The interpretation given to each painting can vary from person to person but all of these paintings have something in common, they seem to tell the same story, incredible “flying machines” appear to be incorporated in the “scenery”. But who could have possessed the ability to fly at that time in history? Were these flying machines misinterpreted? Are they “clouds” or “angels” or is there something more to them? Are these different authors sending a message in their art? If there is one thing that these paintings are not, that is ordinary. One of the paintings that we find very interesting is the “The Baptism of Christ” by Aert De Gelder. Looking at this painting the first thing that you notice are these strange rays of light that are coming down from a disk shaped object in the sky. It is one of the most interesting paintings and according to the Ancient Alien theory, this painting is a piece of strong evidence which illustrates a Disk Shaped flying object. The author of the image painted a circular object, it cannot be confused as a cloud, it appears to have some sort of light at the center and the rays of light are coming out of this object, you cannot confuse it for thunder or anything else really. We believe that the author painted what he saw at a certain point in his life. If he wanted to paint a cloud, or the sun he would have painted them in a much more effective way. We believe that this painting illustrates a disk shaped UFO, much like the disk shaped objects that are reported even today. “The Miracle of the Snow” by Masolino Da Panicale is another incredible image that we cannot pass by without taking a closer look. This painting was previously known as Dedicatio Sanctæ Mariæ ad Nives (Dedication of the Church of Our Lady of the Snows). This painting is very interesting because it illustrates a large number of disk shaped objects flying in the sky. The first thing that you can think of to explain these objects are clouds but are they really clouds? 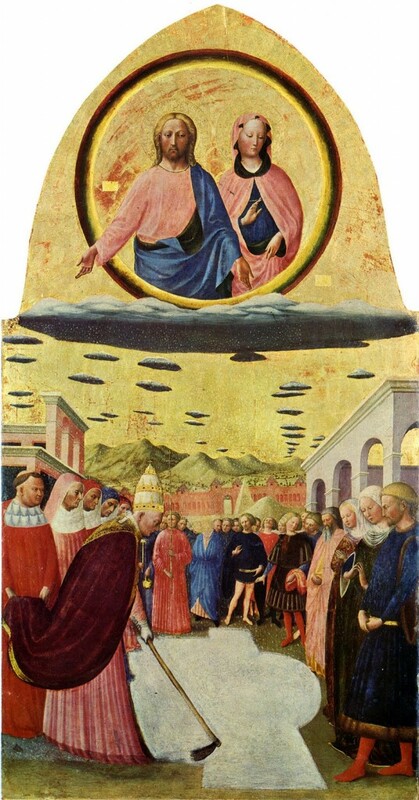 Did this author paint all of the clouds at that time giving them a “disk” or saucer shape? One of the objects in this painting that drew particular interest is the object to the right just above the building. When you look at it, it shows incredible similarity to some of the modern day depictions of Unidentified flying objects. This object in our opinion does not look in any way like a cloud. 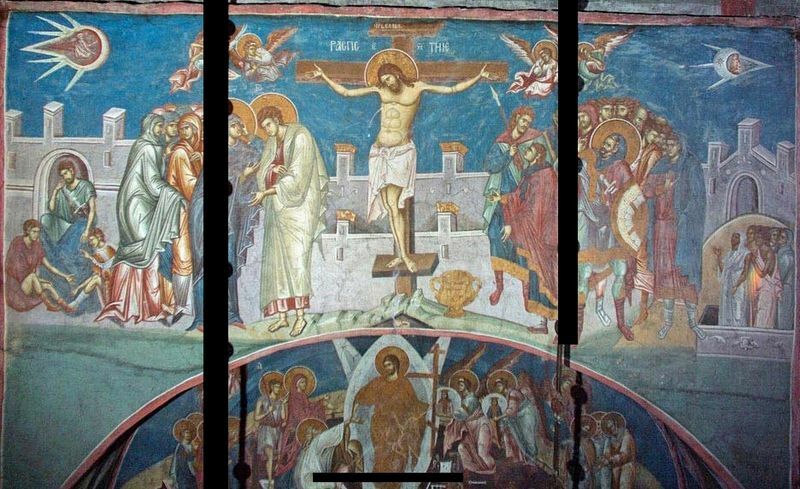 This painting is a very detailed piece of art, we see several different objects that are illustrated around Christ, but after looking at the painting, there are two objects which seem to stand out from the rest of the items on the painting. Located to the left and the right of the painting they seem to depict two humans that are inside some sort of spaceship. According to modern day explanations, these “objects” are placed in the painting to depict the sun and the moon like in other paintings. But why place “pilots” or a human inside them? Was the artist really trying to illustrate our Sun and the Moon? Or was the artist trying to depict something otherworldly? By observing the left object in the painting, we see that the “pilot” inside this particular object appears to be manipulating something in front of him, his arms are painted stretched out and reaching for something in front of him. The object to the right shows the figure turning his head to see whats behind him. Are these two objects depictions of UFO’s and their crew? Or are they simply the artists way to illustrate the sun and the moon? Another painting that we find extremely interesting is “The Annunciation” painted by Carlo Crivelli. This artist favored verdant landscape backgrounds, and his works can be identified by his characteristic use of fruits and flowers as decorative motifs. His works were clear and definite in contour, with astounding attention to detail. In his painting “The Annunciation” there are several objects that stand out from the rest of this extremely detailed piece of art. First of all we have a circular shaped cloud, inside the cloud we can see several “angels” looking outside of the cloud, but what makes this interesting is the ray of light that shines on a “pigeon” and on Mary’s head. Now what we find puzzling is that in this painting Carlo Crivelli painted several other clouds, in fact the sky is filled with clouds, but he decides to paint this specific “disk shaped” cloud with “angels” and a beam of light? Why paint one specific cloud so different in comparison to the other clouds present in the painting and with a beam of light? 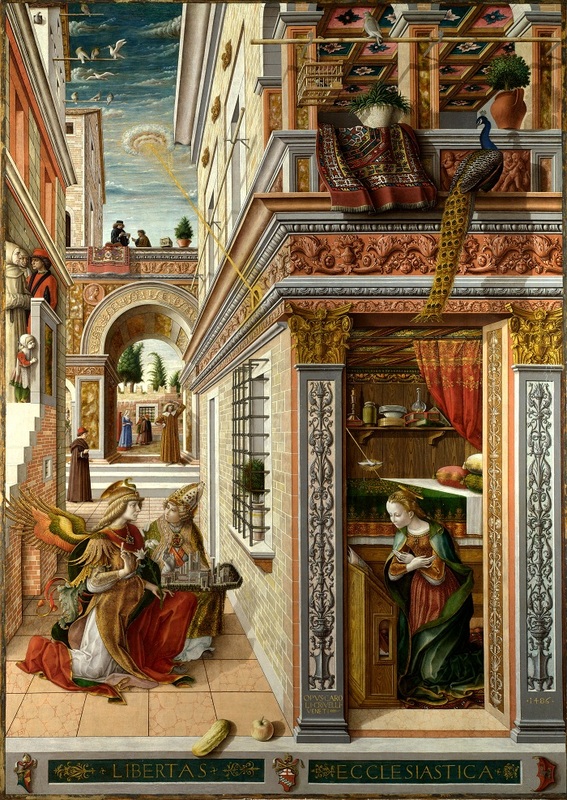 From what we have seen in similar paintings, the artists usually paint beams of light descending directly form angels or from the sun, but this is not the case in Carlo Crivelli’s painting in which he payed extreme attention to the details and made sure the public could tell the difference when looking and analyzing this masterpiece. We can also see a person that Carlo Crivelli decided to incorporate in the middle of the painting which is looking at the sky– at this disk shaped cloud just below the gate. The Madonna with Saint Giovannino painted in the 15th century. Another painting that can be added to the list of ancient paintings that depict a unidentified flying object. UFO’s and Ancient Art present in some of the most important paintings by mankind, a coincidence? we think not. 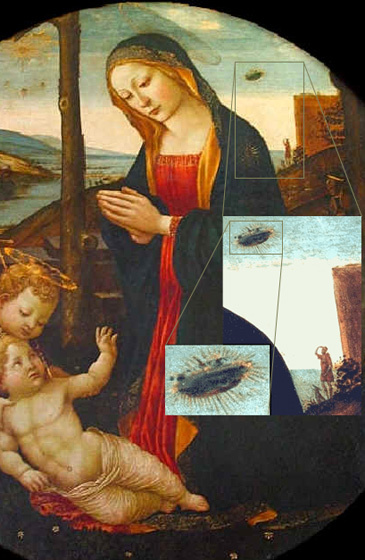 Above Mary’s left shoulder we observe a disk shaped object that appears to be glowing – a UFO?. It is an object which the artist depicted in great detail making sure it would stand out in the painting. To the right of the painting we see a man that is holding his right arm above his eyes with which the artist made sure to send a message that this object was very bright. To the left of the image in the upper corner we can see an object that looks like the sun. This means that the artist painted this disk shaped object, giving it a shiny detail and he made sure to illustrate it to the right of the sun so we know this bright object cannot be confused for the sun, this disk shaped object does not look like your ordinary cloud, so if it is not the sun nor a cloud what could it possibly be? Is The Madonna with Saint Giovannino painting an illustration of an otherworldly visitation? The artist considered this object extremely important, otherwise he would not have placed it nor painted it with such detail as we see here.